Why do you use a social app? Is it to connect with friends and family, or for some creative inspiration? Perhaps you just want to check how many likes your latest post got? 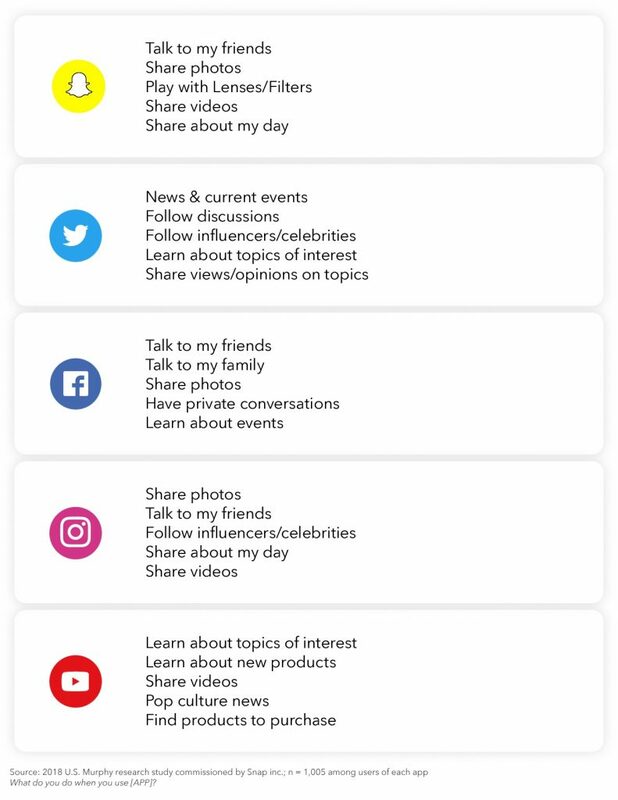 In a quest to learn more about the social apps we use, Snapchat and Murphy Research teamed up to comprehend when we use them and how each platform actually makes us feel – and the results are intriguing. 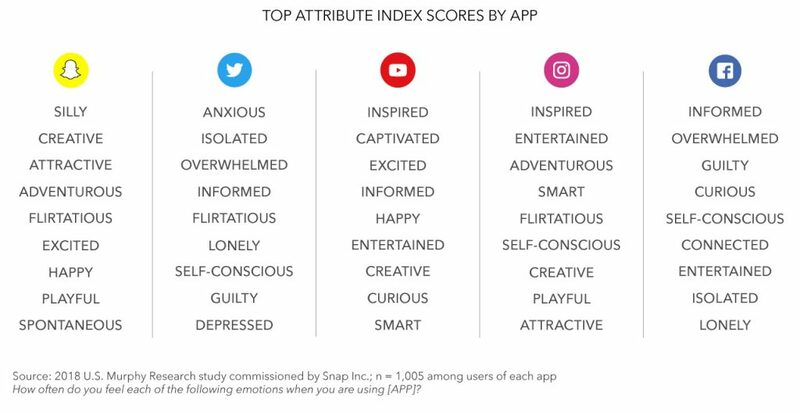 Keeping in mind that this was a Snapchat-commissioned report, there’s no surprise that the platform trumped its rivals in the “feel-good” department; where users feel happy when using it. On the contrary, Twitter and Facebook made people feel self-conscious and lonely. But what does this tell us as marketers? Well, if we can identify users’ feelings whilst on each platform, we can compare these emotions to our product/service offering in order to increase success rates. For example, a dating service – relatable with loneliness – should advertise or form a superior presence on Facebook and Twitter as opposed to the ‘silly’, ‘happy’ nature of Snapchat. This then sways our attention to why people use each social app and there’s a unique connection between business and platform every time. Take Facebook for instance – people use this network to learn about events, which grants an opportunity for those hosting, organising or promoting an event. Here, the real key is to understand how each platform can most effectively benefit your marketing efforts. If you want to introduce people to your new product, YouTube is the ideal platform; if you’re looking to capitalise on celebrity endorsement and micro influencers, Instagram is suitable. Needless to say, some platforms will prove more useful than others; depending on your offering and the opportunity. But when do we use these apps? Murphy Research’s findings also revealed when people are using these social apps. Here, Snapchat and Twitter are mostly used while on-the-go, commuting, socialising and shopping. Alternatively, Instagram, Facebook and YouTube are preferred when the user is idle. This tells us more about how we should be targeting users on each platform and even more so, how we should communicate the message. For instance, a Snapchat video advertisement should be short and concise, while a longer and more informative YouTube commercial would match the idle but captivated audience. Social media will continue to prove indispensable among our marketing strategies, thanks to it’s low-cost, controllable and measurable nature. However, we must attempt to stay updated on trends, user behaviour and the feature differences between platforms. This way we can identify those golden opportunities that enhance our online success.